We’re delighted to announce that Sports Direct will be exhibiting at Jobs Expo Dublin. Their recruitment team will be talking to jobseekers about the great opportunities at their company. Register for your FREE tickets today and meet them on 27th April at Croke Park. Founded as a single store in 1982, Sports Direct International plc is today the UK’s largest sporting goods retailer by revenue. The Group operates a diversified portfolio of sports, fitness, fashion and lifestyle fascias in over 20 countries. Today, they’ve approx. 26,500 staff across five business segments. These include UK Sports Retail, European Sports Retail, Premium Lifestyle, Rest of World Retail, and Wholesale & Licensing (formerly Brands). Furthermore, their business strategy is to invest in their people, the business, and their key third party brand partners. As a result, this elevates their retail proposition across all their channels to attain new levels of excellence. 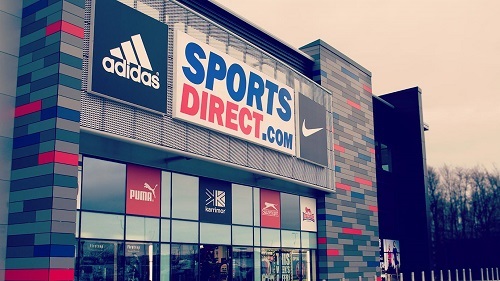 In UK Sports Retail, they offer a complete range of sporting apparel, footwear and equipment through their predominant fascia, SPORTSDIRECT.COM. This segment includes their lifestyle fascia USC. Their current forward-looking view is that the majority of their offering to customers must include leading third party brands. In addition, the elevation of their sports retail proposition is key to ensure they are fully aligned with the future directions and ambitions of these brand partners. The UK Sports Retail segment also includes the fitness division, which currently consists of 31 gyms. In European Sports Retail, they’re evolving customer proposition in line with the elevation strategy, while also seeking to increasingly tailor their proposition to the local markets where they operate. These include the Republic of Ireland and continental Europe. In Rest of World Retail, at the beginning of FY18 we acquired 49 stores trading as Bob’s Stores and Eastern Mountain Sports. They also have 30 stores trading as SPORTSDIRECT.COM in Malaysia. In Premium Lifestyle, they’re developing the Group’s premium offering, which primarily consists of the Flannels fascia, along with Cruise and van mildert. They aim to offer fashion-conscious consumers a luxurious, multi-brand retail destination with high-end and on-trend products. This is a core component of the elevation strategy and includes the provision of a new flagship Flannels store on Oxford Street in London which is anticipated to open in 2019. In Wholesale & Licensing, the Group retains a portfolio of world famous heritage brands, which they offer via their fascias, and also wholesale and license to partners internationally. Their own brands include Karrimor, Slazenger and Everlast. The Group is also proud to have a number of sporting and entertainment personalities as ambassadors, as well as supporting sporting events and venues.